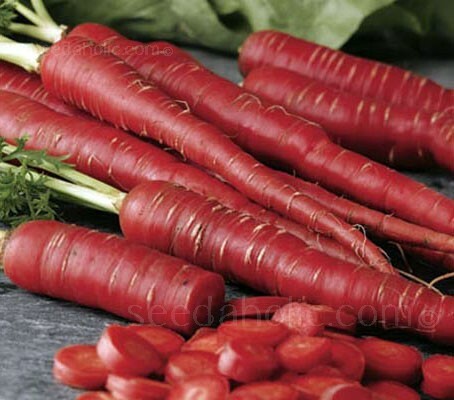 Bred in Japan, Carrot 'F1 Red Samurai' is a distinctive and beautiful carrot, with long tapered roots and uniform bright red skin. A second early, maincrop variety, Samurai produces conical roots that will grow to 28 to 35 cm (11 to 14in) long. Sow successionally from March to July for harvesting June to September and store maincrop roots in dry sand or soil. There are two distinct groups of carrot— temperate or European carrots and tropical or Asiatic carrots. European carrots are biennial, whereas Asiatic types are annual. The Asiatic types are conical in shape and generally dark coloured because they have more of anthocyanin pigments and less of carotene. A wider range of colours from black and red to yellow is found in the Asiatic group. It is thought that Asiatic carrots originated some 5,000 years ago in middle Asia. They are still cultivated but are being rapidly replaced by orange-rooted Western carrots. Asiatic types are high-yielding. They are more juicy and have bigger core, a heavier top and can be grown much earlier than European types. Success with root vegetables is very much down to the quality of the soil, so it’s worth taking the time to prepare your patch. Start digging over your soil in late winter or early spring, removing any stones you find and turn the soil until it has a fine, crumbly texture. If your soil is not ideally suitable, you can prepare a large container instead. Do not add manure as this makes the soil too rich for the seeds. Too much nitrogen will cause the carrots to grow hairy little roots all up and down the carrot. Carrots sown in February in a cold frame/cloche are ready to harvest by June. Put the cloche in place a month before sowing as this helps to warm up the soil. Carrot seeds are small, but it’s wise to plant them as thinly as possible. This reduces the amount of thinning necessary and potential risk from pests. Mix the seeds with a handful of sharp sand and sow the seeds and sand together. Sand will also aid drainage. Once the seedlings are showing their first rough leaves, thin to 5 to 7cm (2 to 3in) between plants. Use a lightweight fleece over the bed to increase the temperature of the soil while also preventing the carrot flies from laying their eggs. The plants need little other attention during their growth period, although the plants should be kept well watered – too little water results in coarse, woody roots. Harvesting: 12 to 20 weeks maturity. June to September. Start pulling up your carrots as soon as they are big enough to eat. It’s best to harvest them in the evening to avoid attracting carrot fly. Late-sown carrots must be lifted by October to be stored over the winter. Carrot fly is drawn to carrots by the smell of crushed foliage, reduce the risk of an attack by thinning plants in the evening on a still day, removing any thinnings and watering afterwards. Carrot fly are also low-flying insects: erecting a ‘wind-break’ style shield around a crop will also help deter these pests. Carrots do well alongside most plants, especially Chives, Garlic, Rosemary and Sage (which deter Carrot Fly). Thanks to countless romantic representations in movies, the word, Samurai, pronounced sah-moo-rai, has come to signify the superhuman warrior. Actually the word finds its root in samorau (or saburau). This is a verb in Japanese that means "to serve". Samurai, the historically famous warriors of Japan, were known for their bravery, sense of honour, fighting skills and, of course, for their elaborate armours and weapons. They were an elite class of warriors who loyally served their masters, the Daimyo. Most Samurai were well-educated and highly versed in literature and the fine arts. They had many pursuits outside of the arts of war. Samurai were, in general, followers of Bushido - which translates as "Way of the Warrior" which guided their actions on the battlefield and off. Samurai were skilled in the use of a range of weapons such as bows and arrows, knives, spears and guns; but their most famous weapon and their symbol was the long sword called a Katana. Only a Samurai warrior has the right to carry a Katana. 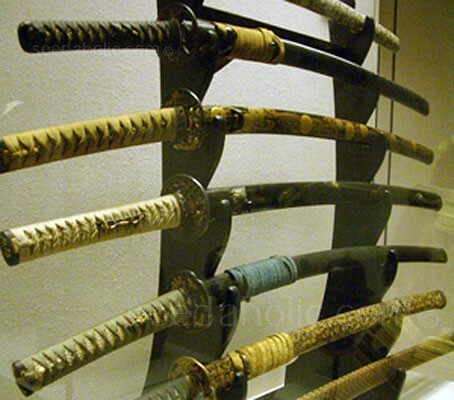 More than a weapon, the sword is a symbol of the samurai spirit and pride. It was regarded so sacred that it was used by a warrior as a last resort. The Samurai believe that the long sword is his soul so it must only be drawn out in the name of his honour. Though the real Samurais had long been gone, there are people who continue to emulate the Bushido or “Way of the Warrior”. The picture above is a hand-coloured albumen silver print by Felice Beato, 1860s. It shows the Satsuma Samurai during the Boshin War period. 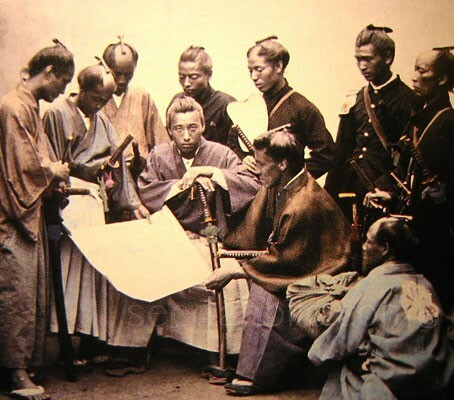 The Boshin War was a civil war in Japan, fought from January 1868 - May 1869 between forces of the ruling Tokugawa shogunate and those seeking to return political power to the imperial court. The Boshin War testifies to the advanced state of modernisation already achieved by Japan barely fourteen years after its opening to the West, the already high involvement of Western nations (especially the United Kingdom and France) in the country's politics, and the rather turbulent installation of Imperial power. Over time, the war has been romanticized by Japanese and others who view the Meiji Restoration as a "bloodless revolution," despite the number of casualties. Various dramatisations of the war have been made in Japan, and elements of the conflict were incorporated into the 2003 American film The Last Samurai. Thin the seedlings to 5 to 7cm (2 to 3in) between plants. 12 to 20 weeks maturity.